I just love the beach. I grew up about a block away from the Atlantic Ocean but I started really loving long days at the beach after moving to Naples. I’m now totally spoiled, living near the Amalfi and Sorrentine Coasts, the islands in the Gulf of Naples (the most famous- though not my favorite- of which is Capri), and the stunning Cilento area. And last summer we spent three weeks in Sardinia, touring the most breathtaking beaches I’d ever seen. 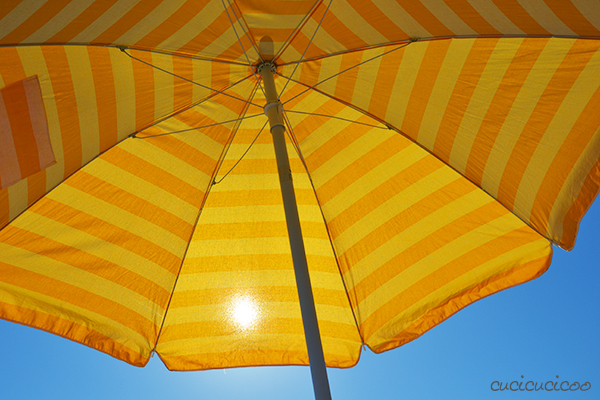 Every beach we visit, we’re always accompanied by our trusty yellow beach umbrella. Sometimes we have to climb up and down steep hills or walk relatively long distances to get to these amazing places. Alas, last summer while hiking 45 minutes to a gorgeous hidden beach on Asinara Island in Sardinia, packed up with backpacks, bags, lunch, insulated bag, and Nicky in the child-carrying backpack, our umbrella’s plastic carry bag tore completely apart, making it totally useless. We did the best we could wrapping string around it to try to keep everything together, but it was clear that we’d be needing a new carry bag, and soon!! I thought it out in my head, drew a little sketch, did a few calculations and figured out a pretty easy way to make a sturdy carry bag with a convenient shoulder strap. And I love it! It’s not only infinitely cooler looking than the original one, the strap is also much more comfortable than the original thin plastic one. It’s been great so far this year! Just swing it over your shoulder and make your way all the way down to that fabulous secluded spot way at the end of the beach! 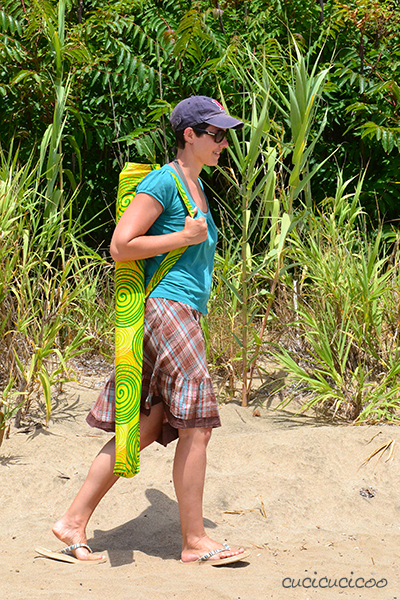 Want to bring your umbrella to the beach comfortably and in style? 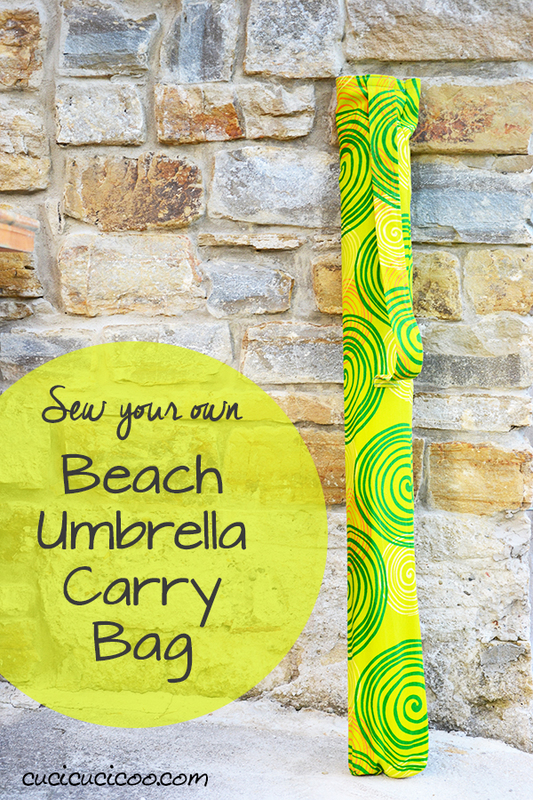 Well, then whip up one of these guys and you’ll never have an excuse to not bring your umbrella to the beach! First off, measure how long your umbrella is when disassembled. Then you want to measure around the widest part. 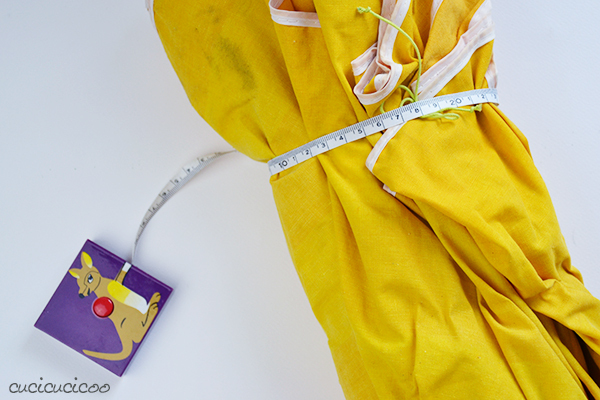 I suggest either measuring it while squished in its original carry bag or to tie some string or twine around it to compress the layers of fabric before measuring. It’s best to keep the bag on the tight side so that it won’t slide around inside. Mine was 113 cm high and 32 cm around the widest (compressed) part. 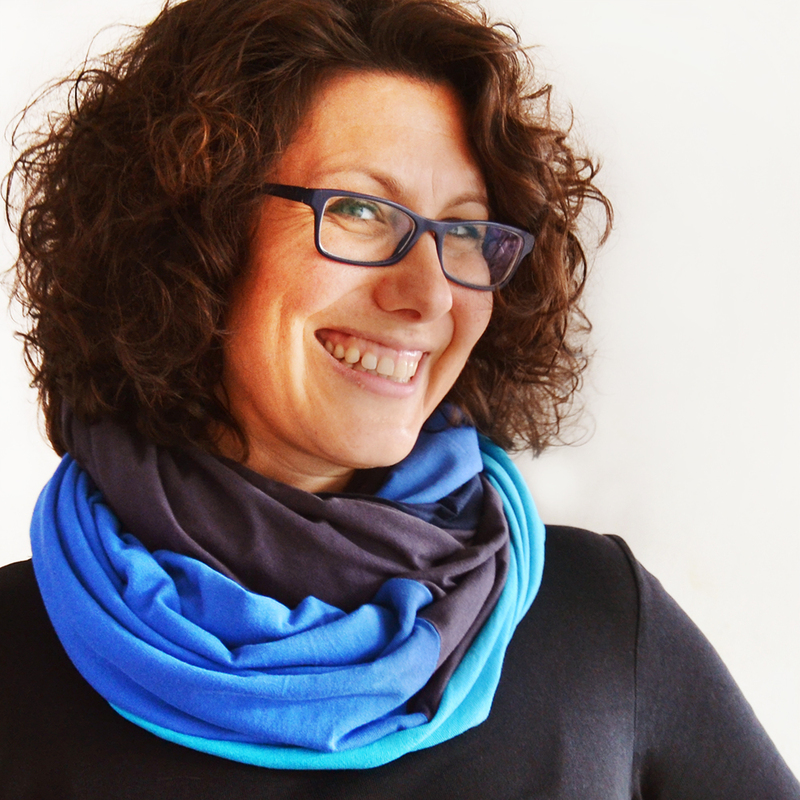 Now let’s talk fabric. 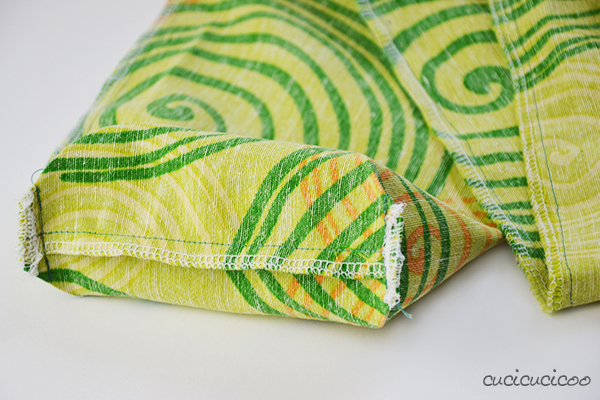 You need a heavy weight fabric, so I used this funky upholstery woven cotton yardage. 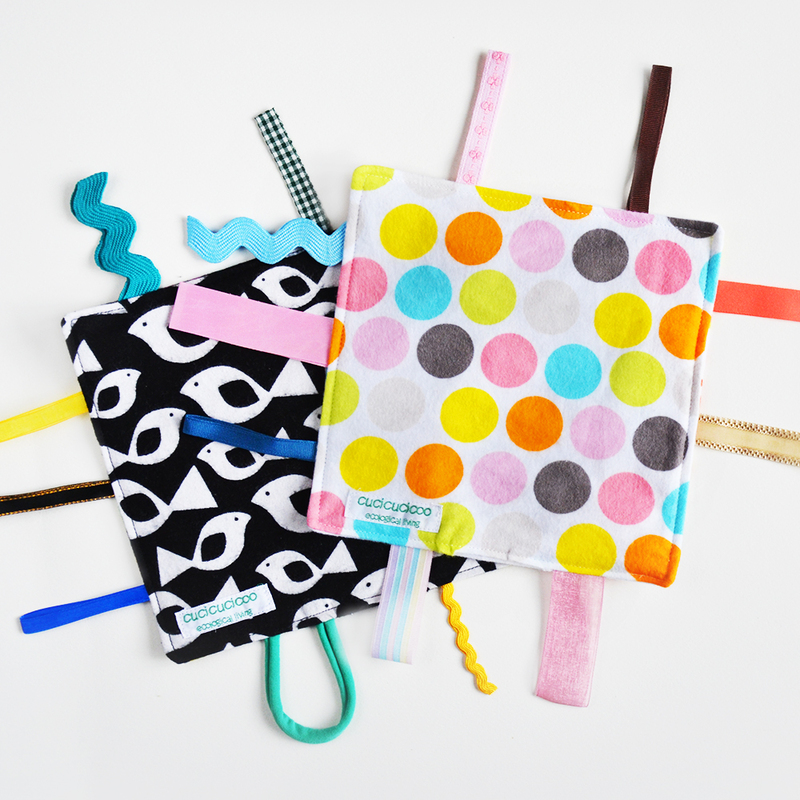 You can use the same sizes that I used, but you might prefer customizing your bag to your specific umbrella. Your main rectangle will be: (umbrella length) + 8 cm x (umbrella circumference at the widest part) + 4 cm. So mine ended up 121 x 36 cm. 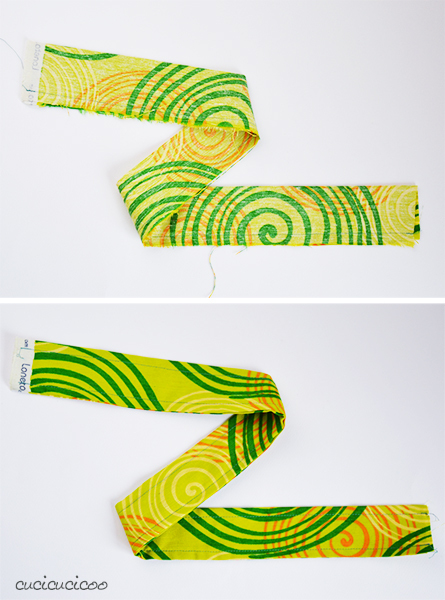 Cut a second rectangle for the strap: 12 x 70 cm. It’s totally fine to leave ugly selvage on one short side of each rectangle. Something I like to do when I have to cut long straight lines is to measure where the fabric needs to be cut and make a cut. Then I hold each edge of the cut fabric in a hand and tear the fabric apart. The fabric will rip in a straight line along the grain. 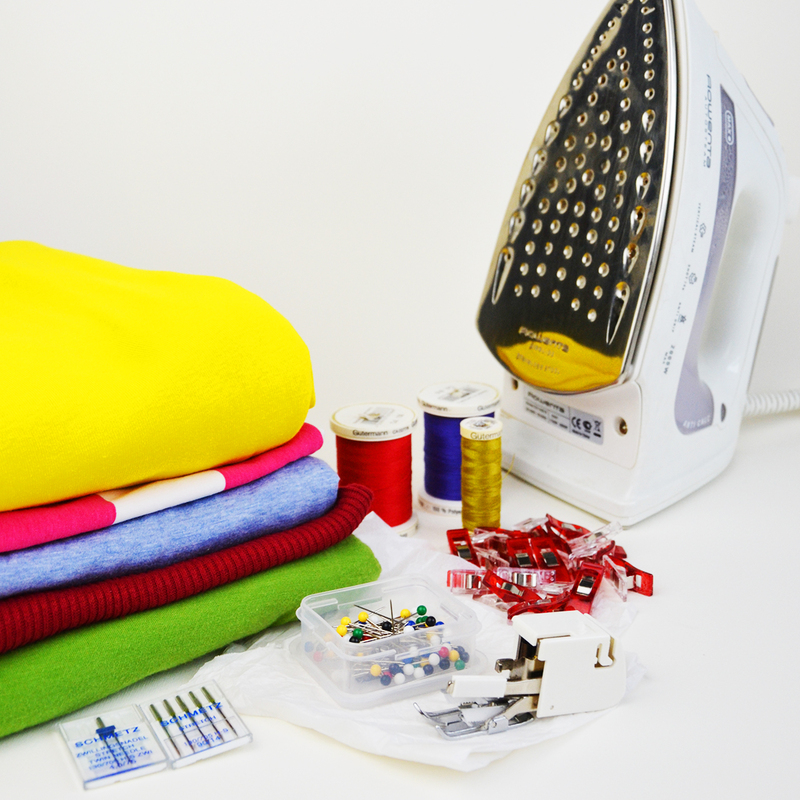 Note that this will only work on woven fabrics! Let’s first prepare the strap. 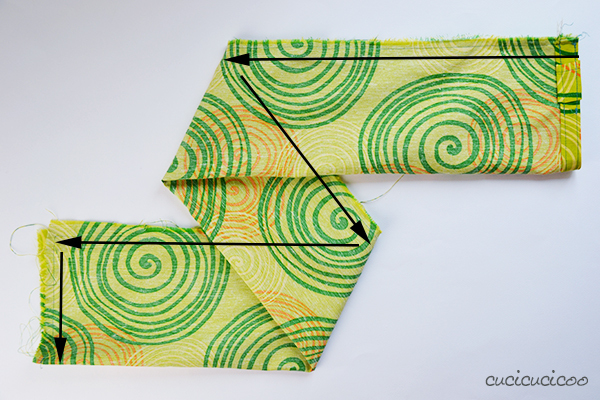 Fold the second smaller rectangle in half the long way, right sides facing and iron it flat. 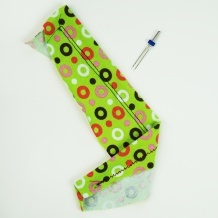 Sew down the open side with a 1 cm seam allowance, turn right side out, press flat and topstitch along each long edge. The short ends will remain open. 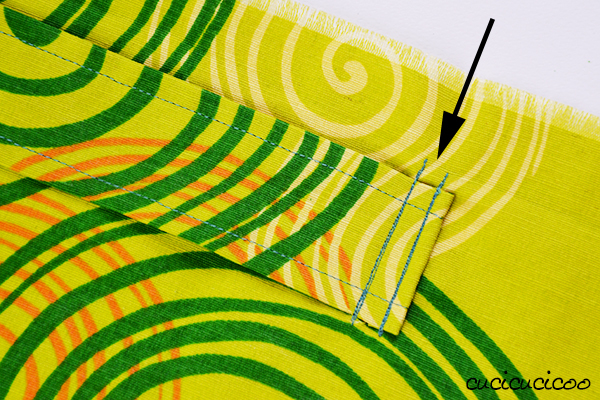 Fold and iron down one short side (the one with the selvage, if you included it) of the larger rectangle by 2 cm. Slip one end (the one with the selvage, if you included it) of the strap under the fold about 4 cm in from the left side of the large rectangle (top photo). Fold the edge down again by 2 cm, with the end of the strap enclosed underneath. Iron and pin in place (bottom photo). If you want, you can stitch down the folded edge where the strap is, but I honestly didn’t bother. 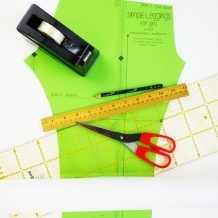 Remove the pin, flip the strap up, over and back down on the right side of the large rectangle. Iron flat, making sure that the strap is pulled close to the folded edge. Pin in place, then sew two lines of straight stitching along the entire folded edge, sewing the strap down flat as you go. You might want to sew over the overlapping flap more than once to give it more stability because this will be the main stress point of the bag. Now let’s attach the other end of the strap. You don’t want it stay flat against the main fabric or else it will be too tight and uncomfortable when carrying the umbrella. 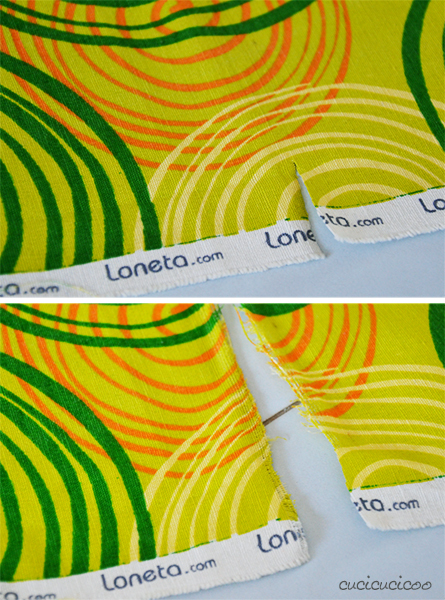 Lay the strap down flat along the main fabric, making sure that the end is 4 cm from the cut edge. 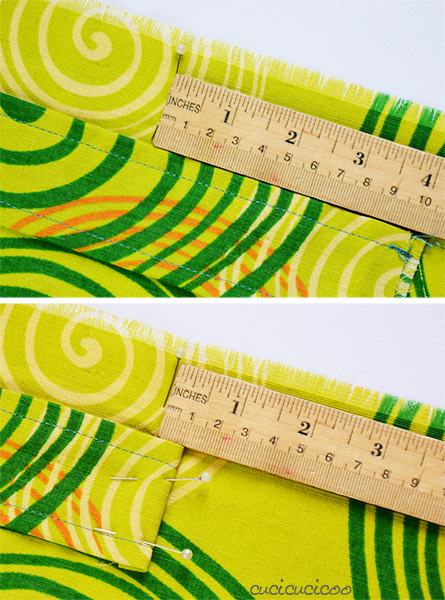 Measure 10 cm up from the bottom of the strap and mark that point with a pin (top photo). 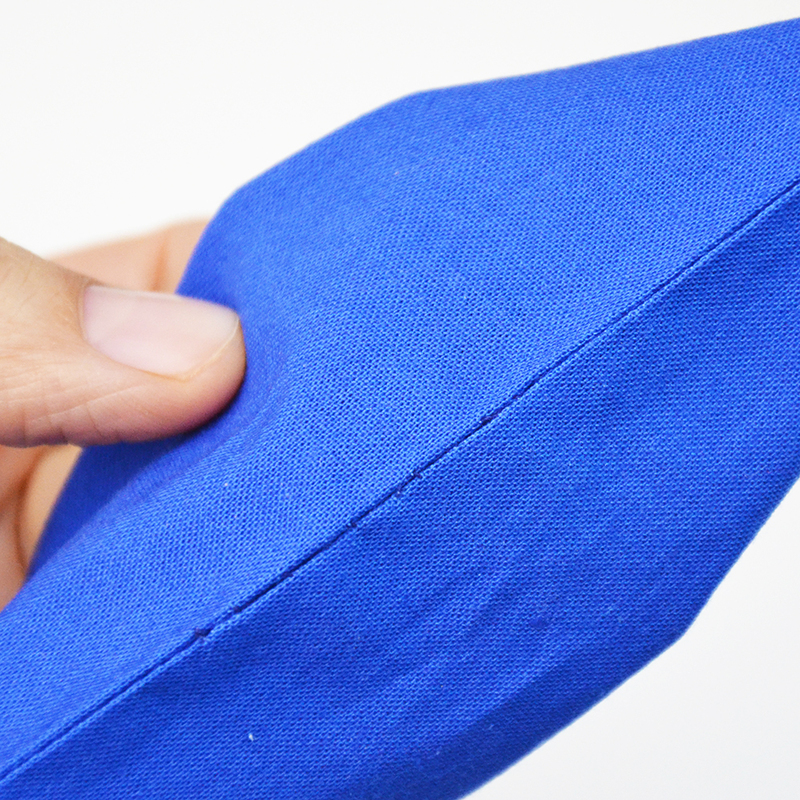 Fold the end of the strap under itself by 1 cm and iron flat. 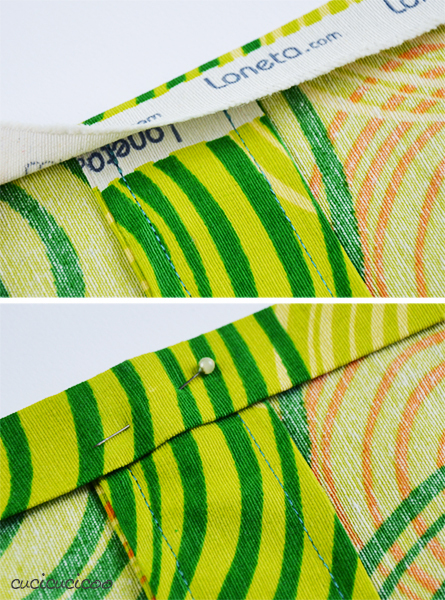 Then reposition the strap so that the folded end is 1 cm below the pin you placed in the fabric previously (bottom photo). Pin the strap in place. Stitch the end of the strap down about 0.5 cm from the folded edge and again about 1.5 cm from the edge. The double lines of stitching make the strap more sturdy and also enclose the end of the strap. 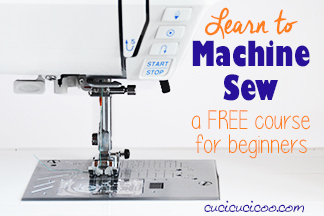 You might want to sew over these lines another one or two times, just to make them sturdier. Fold the large rectangle in half the long way, making sure that the strap is pulled as far inside towards the fold as possible, and iron flat. 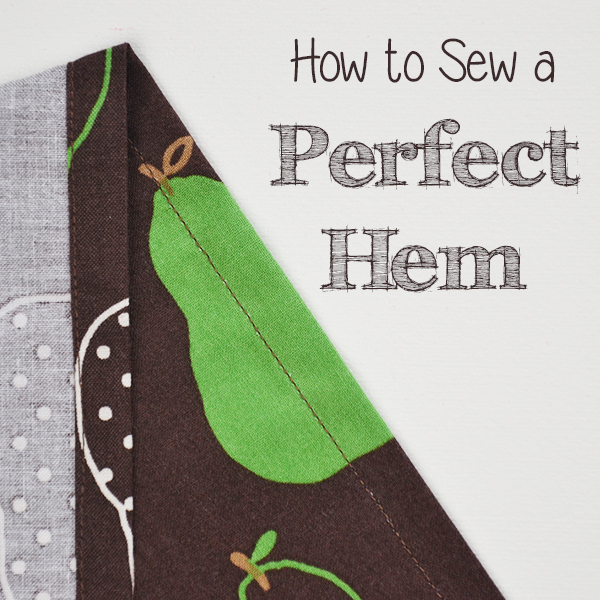 If the two long sides don’t match up perfectly, make sure to match up the folded and sewn edges so that the opening of the bag is even. Then sewn down the long side, starting from the folded edge, and then across the short end of the bag, which becomes the bag bottom. 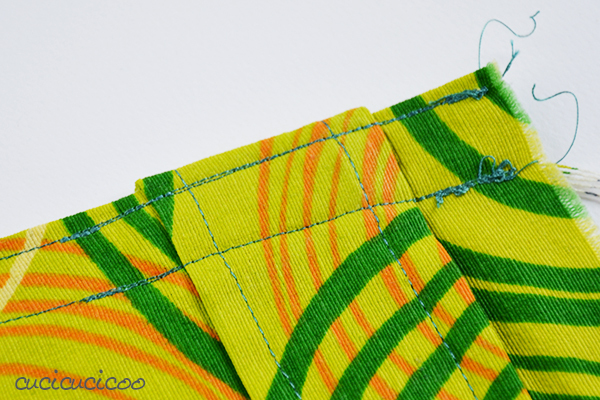 Use a 1 cm seam allowance and be very careful not to accidentally catch the strap in your stitching. In this picture my stitching looks all zig-zaggy, but it was actually straight. I just folded the fabric to fit the length into the photo properly. A nice bonus to having a fabric carry bag is that you can wash it. To keep the edges from fraying in the wash, trim and zig-zag stitch the raw edges or just serge them, which is what I did. 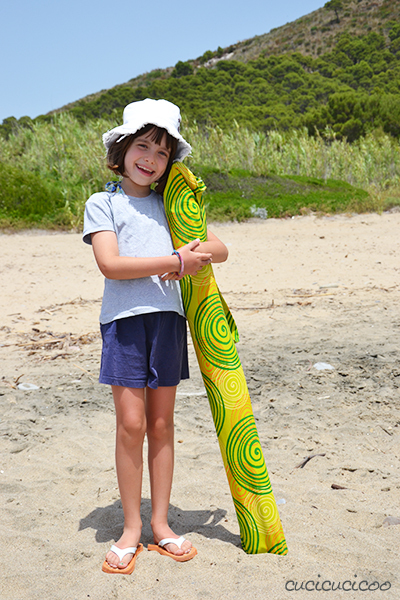 And now you have yourself a very cool and comfortable beach umbrella carry bag! Don’t worry if it’s a bit tight; it’s made that way on purpose, but if you prefer a roomier bag, just add a few centimeters to the short side of the large rectangle. Take it with you every time you go to the beach so instead of stressing about dragging around unwieldy objects, you can just get to your ideal beach spot and relax in the shade! 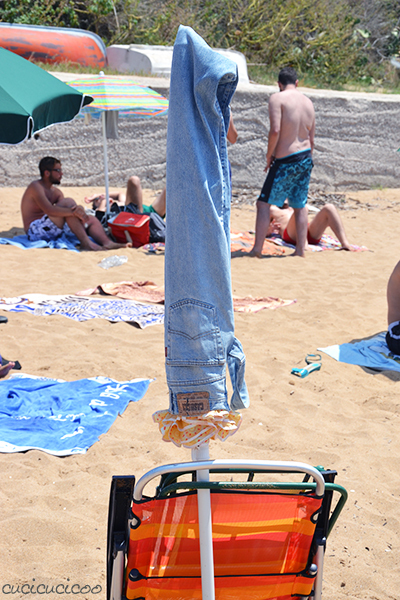 And wouldn’t you know it, only after making this bag I spotted this awesome umbrella carrying bag on the beach made from the leg of a pair of jeans. Genius! Now why didn’t I think of that?! Oh well, I still love my new umbrella bag and how easy it makes it for us to get to and from the beach now! And if you want to stay really cool at the beach, why not bring a nice thermos full of ice cold homemade sugar-free lemonade? 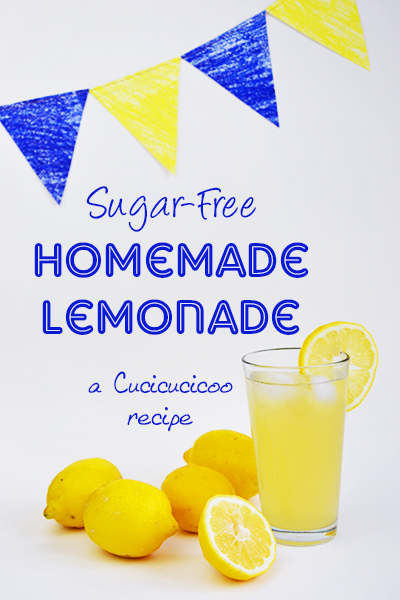 So refreshing on hot summer days, and healthy, too! Question of the day: Do you like going to the beach? What’s the best beach you’ve ever been to? Like I already said, I LOVE the beach! Not only because I love the water, the sun and just relaxing, but because I love seeing how much fun my kids have playing. 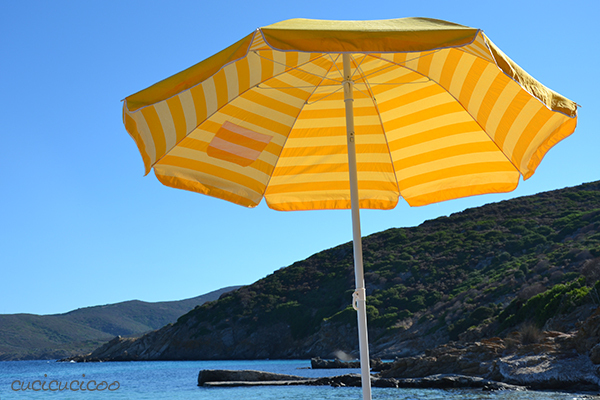 I’d have to say that the most incredible beaches I’ve ever been to are in Sardinia, and the ones that stand out the most in my memory were on Asinara Island. I felt like I was swimming in a sandy-bottomed swimming pool with fish in it, that’s how clear and clean the water was. Plus the scenery and wild donkeys roaming around made it all the more memorable! But now that I think of it, the beach at Piscinas in Sardinia was extraordinary, too. So hard to choose…!! 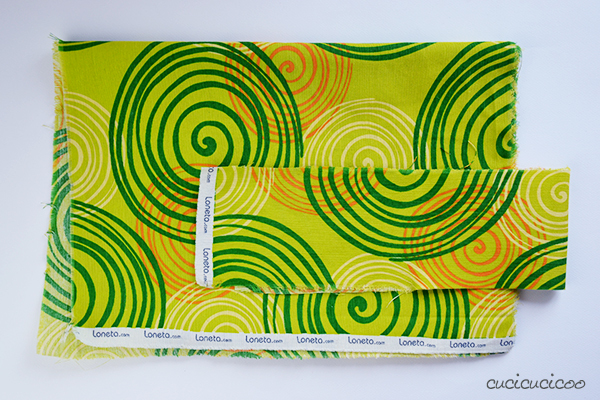 Previous articleBecome a Cucicucicoo Pattern Tester! When I first started working in fabric stores, many years ago, we were taught to tear fabric, by gently pulling evenly after a good snip. I don’t know why this has changed as you can certainly tell when a piece of fabric is really off-grain this way. Now the practice seems to be to either cut with scissors and/or a rotary cutter. I prefer the tearing on the crosswise grain method. 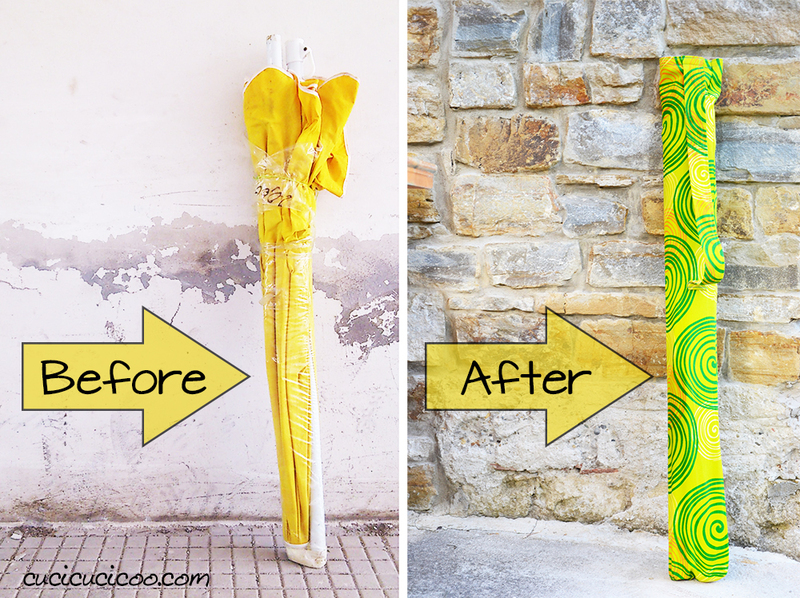 Love your cloth umbrella holder-plastic seldom lasts as long. Yes, you are so right, Rosemary! My mother taught me ages ago to always pull out one thread from woven fabric to see exactly where the grain is because fabric is rarely cut perfectly along it. Unfortunately, I’m usually too lazy to do it! However I do like to take advantage of this characteristic of wovens when cutting out rectangular pieces! Thanks, Bea! 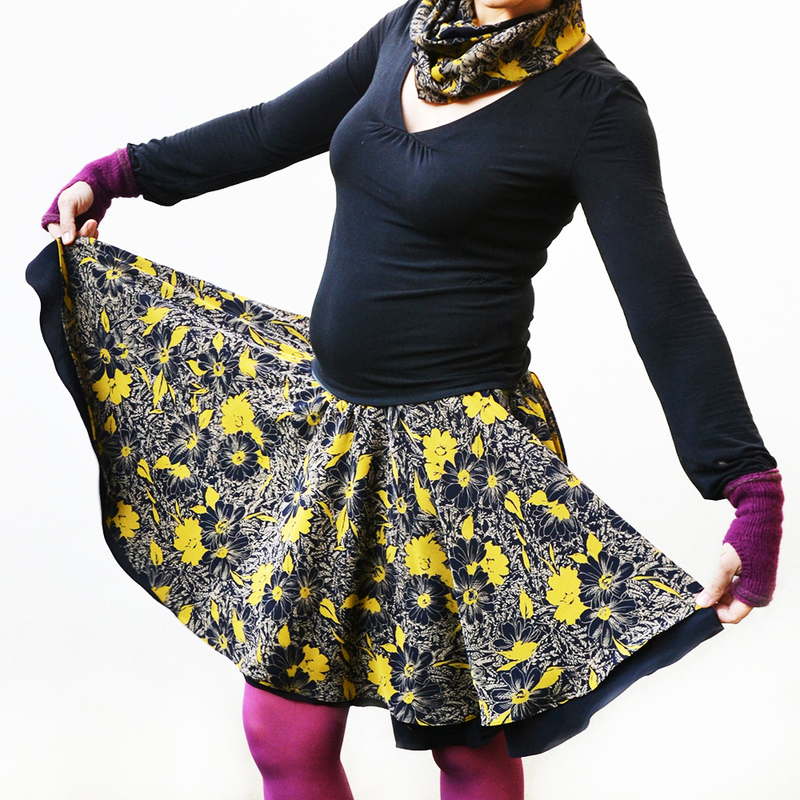 I know, I love that fabric! 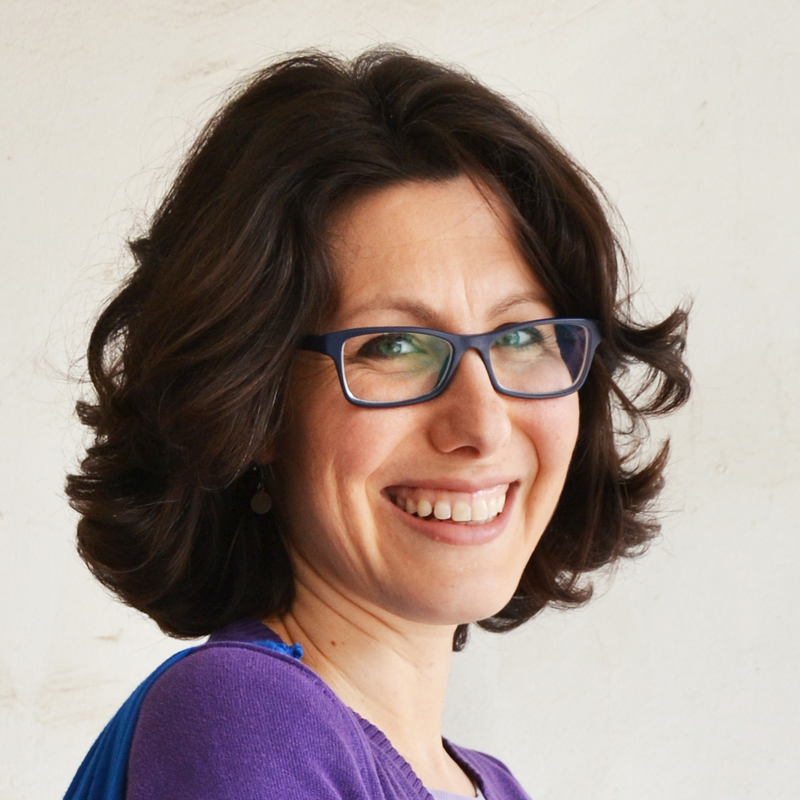 Questa sacca è fantastica! Mi farebbe proprio comodo…porto sempre l’ombrellone con me 🙂 Se trovo la stoffa giusta provo a farla! Quant’è bella la Sardegna! 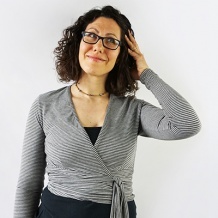 è un posto pieno di cose interessanti da vedere e fare!